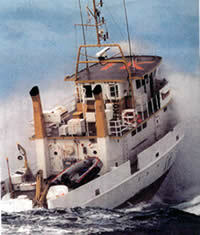 History of Takapu 2 ex NZ Navy Survey Vessel. Takapu2 — formerly Her Majesty's New Zealand Ship (HMNZS) Takapu — was one of two inshore survey craft commissioned by the Royal New Zealand Navy in July 1980. She was built to the highest naval specifications by the Whangarei Engineering and Construction Company (WECO) in Northland, New Zealand. Her twenty-year mission was the hydrographic surveying and charting of New Zealand's coastal waters which, in some places, had not been updated since Captain James Cook's survey of 1769-70. With her steel hull construction, aluminium superstructures, numerous watertight compartments and doors, Takapu was designed to operate safely in all weathers, seas and conditions. Indeed, the often-rugged New Zealand coastline is notorious for its rough seas, especially on the west coast of both islands, and in Foveaux Strait, in the deep south between the South Island and Stewart Island, where she spent much of the her last two years of naval service. With a naval complement of eleven Takapu was also involved in other naval operations including search and rescue, rendering assistance to vessels in distress, assisting in the protection of the New Zealand marine environment, and naval goodwill visits to many New Zealand ports. On 8 June 2000 — twenty years after her launching — the Royal New Zealand Navy decommissioned Takapu (and her sister-ship Tarapunga). She had done her duty for her country, her naval sea-faring record was faultless, and her twenty-year task had been accomplished with honour. But a new chapter was about to begin. The current owners Bill and Mandy Leckie purchased Takapu in December 2000, and had to renamed her Takapu 2 for registration reasons, and began a major refit. Stage 1 was completed in December of 2002, in time to accommodate a corporate charter by Vodafone New Zealand during the Louis Vuitton regatta finals (prior to the America's Cup) and the Americas Cup proper in the early months of 2003. After the completion of the America's Cup Bill and Mandy undertook more work until they were ready to go and cruise throughout Tonga, in late June 2003 during the New Zealand winter. Bill and Mandy returned to Auckland in November 2003 to complete stage two of the Takapu 2 refit — the accommodation deck — in preparation for further South Pacific Island cruising in May 2004.